Earlier this year, the McMichaels Creek was home to the our very own Full Circle Meal. It was a gathering that brought together a rich tapestry of styles and sensibilities, as the Bacon & Lox Society shared sights and sounds, meal and music. A truly one-of-a-kind experience, the Full Circle Meal wound up being as special as it was because of the rich contributions everyone brought with them to our communal table. One of the most truly unforgettable contributions was the music of Lou Rogai. 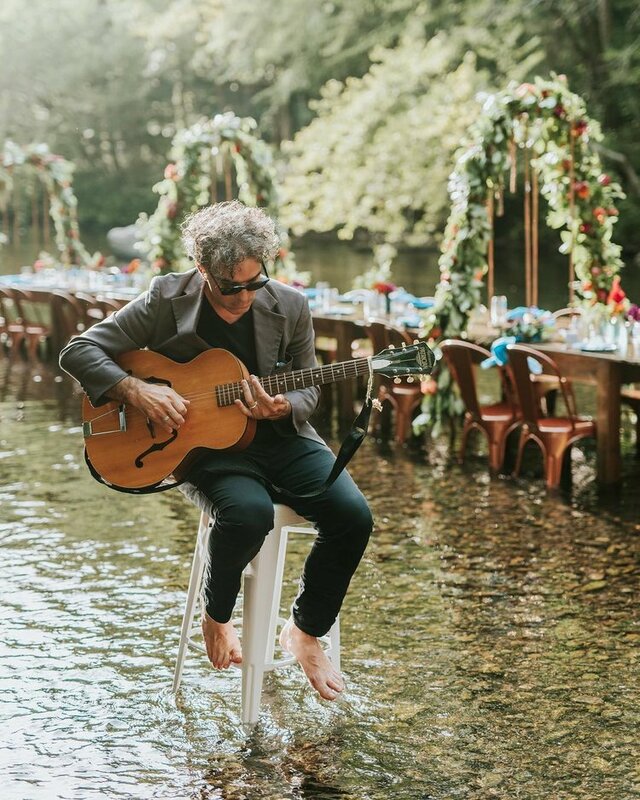 Lou can usually be found making incredible music with his band Lewis & Clarke, and we were lucky to have him add a bit of ambience to the proceedings. Thanks for inviting me to perform! How is it possible that there were twice as many people as last year, but it still felt just as intimate and fun? Well done! Here's a playlist I created for the event. It was fun to make, I hope everyone who was there can take these songs with them and remember our time together. Feel free to send it along to everyone involved! There are some very special selections including transitional songs and water songs, bookended by 2 versions of a favorite summer song, as this was the last big event of summer 2017. I am over the moon about every artist on this mix, some are old faithfuls, and others are new loves. I was thinking about new people to meet and keep in touch with, helping to set a tone for friendships old and new. I hope you enjoy it as much as I enjoyed putting it together. I very much enjoyed improvising music along with the flow of the creek. The laid-back, yet fully charged-up energy beneath the canopy of green was atmosphere enough, all I had to do was interpret what was taking place and allow my instrument to reflect this mood. The group set the varying tempos with rhythms of conversation. The McMichaels Creek was providing its own song, ripples and splashes along the shore and underfoot, my guitar accompanying what we were all involved with, a collection of awesome people in celebration. Thank you again for your graciousness, I think everyone who stepped foot in that creek was swept with the current of creativity and warmth that was flowing in spades.